The IEC Safety Director visits job sites to conduct thorough safety inspections, following a four-page OSHA compliance checklist. We also provide on-site safety training. Please contact us at 502-493-1590 or click below to request more information. This training also identifies additional specific OSHA, EPA, and DOT compliance training that may be required in certain situations. Please be aware that this training will not, however, serve to fulfill any of the compliance training required by the above listed agencies. 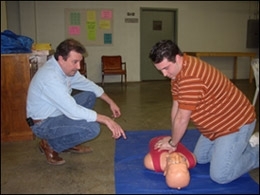 The IEC will be offering First Aid and CPR Training in 2019. It will be for 2 hours of CEU for AGC Safety. 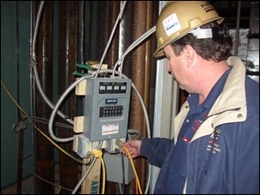 It can also be counted as 2 hours towards your ME / EE, CE Contractors or Kentucky HVAC certification. You must pre-register for class 7 days before the class date. A minimum of 5 students is needed for the class. If there is not enough attendees, the class will be cancelled. All classes are at our location, 1810 Plantside Drive, Louisville KY 40299. 8:00 AM. to 11:30 AM. For more information please contact us at 502-493-1590 or click here to register online. You can also print out the registration form by clicking here. The Independent Electrical Contractors Association of Kentucky & Southern Indiana is a Certified External Provider of the Passport safety training for General, Generation, and Transmission/Distribution lines of business as well as site specific training by request. We offer this program by request where you can schedule our certified trainer to train groups of your employees at a time that is conducive to your needs. The training fees vary with content. The minimum class size is 5 registered/paid students.. Contact the IEC of Kentucky & So. Indiana office for more information, 502-493-1590 or safety@iec-kyin.com .